As far as stunt foods go, loading tacos onto something that's already delicious is a low-risk path. Worst case scenario, you take it apart, and you have tacos. They're probably messy tacos, but they're still tacos. 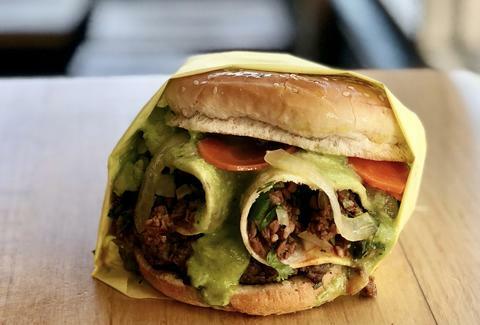 Los Angeles's The Oinkster has unleashed a new creation in collaboration with the LA-based food and culture publication LA Taco. It's called the LA Taco Burger, and it's pretty much your favorite food stacked on top of your other favorite food. "It's been an interesting reception for sure," a representative from the Oinkster tells Thrillist. "Everything we've seen and heard from folks who give it a shot is overwhelmingly positive." The burger is a one-third pound Angus beef patty nestled under two carne asada tacos in corn tortillas with cilantro, onion, and salsa roja. The whole thing is topped with house-pickled jalepeño escabeche and a house-made avocado sauce. "When we went to try out the LA Taco Burger prototype, honestly I was expecting to feel disgusting afterward -- two tacos in a burger?!" said LA Taco editor Daniel Hernandez in an announcement. "But the team at Oinkster have concocted a tremendously good-tasting and cohesive burger that makes a lot of sense after the first bite."